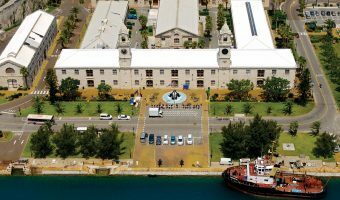 Which Is The Nearest Beach To Royal Naval Dockyard? Bermuda 4u > Frequently Asked Questions > Which is the nearest beach to Royal Naval Dockyard? One of our readers asked about the closest beach to Royal Naval Dockyard (the area where the cruise ships dock). In terms of distance the nearest beach to Dockyard is at Snorkel Park. It’s not the most picturesque of the beaches on the island but it is situated within the Royal Naval Dockyard and just minutes from the cruise ship docks. It has good facilities including a bar, restrooms, and beach rentals. Another beach fairly close by is at Daniel’s Head, the site of the 9 Beaches resort. Although the resort is currently closed the beach is open and there is a concession that rents paddleboards. West Whale Bay is also pretty near. It is, however, a fair distance from the bus stop on Middle Road. There are no facilities here apart from restrooms. The beach itself is small and quiet. There is a beautiful park with great views overlooking the ocean. Most people head for Horseshoe Bay. There are regular buses from Dockyard (bus route 7) plus special buses laid on for tourists that go direct to Horseshoe Bay without stopping (cruise ship season only). Horseshoe Bay has lots of facilities but can get very busy. There are, however, a number of other beaches that you could walk to from here if there are too many people here for your liking (Chaplin Bay, Jobson’s Cove, and Warwick Long Bay). Don’t forget about Black Bay Beach, just before the entrance to Royal Naval Dockyard. There’s a concession there that rents hammocks, chairs etc.